Full Set of 4 Caliper Covers for 2010-2012 Camaro. 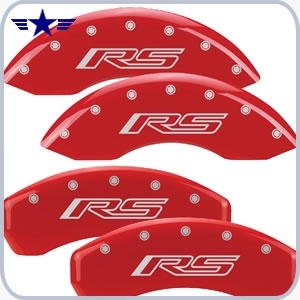 GM Licensed engraved "RS" on all four covers, red powder coat finish with silver characters. Fits Camaro RS, V6, LS, 1LT, 2LT. ¢ Reduces brake dust and keeps your rims cleaner. ¢ Simple Straight Forward Installation. ¢ MGP Caliper Covers are laser cut from 6061-T6 aerospace aluminum. ¢ Bridge union is TIG welded for strength. ¢ Graphics applied using proprietary CNC high speed engraving techniques. ¢ Hydraulically formed to fit OEM brake caliper configuration. ¢ Patented stainless steel fastening system is secured with locking nut. ¢ High quality powder coated finish for all-weather toughness and durability. ¢ Installation is approximately 10 minutes per wheel. No drilling, no grinding, no tape or adhesive, no paint, no cleaning and no messy prep work. All you need is a jack, lug wrench, 3/8" wrench and you'll be ready to roll in less than an hour. ¢ Required clearance between wheel and caliper of 1/8 of an inch minimum (equal to the thickness of two quarters). Please verify clearance before submitting your order. ¢ 3 year warranty against any manufacturer defects. You get QUALITY & keep the JOBS HOME!